There are so many good things about [Jose Julio’s] robotic spider. It’s design is dainty yet robust, and the behaviors encoded in the firmware are nothing short of spectacular. The body is built from a piece of balsa wood in between sheets of carbon fiber. The legs are carbon rods, using two servo motors for left and right leg movement, and a third servo which can move the intermediary legs like the roll axis of a plane. An IR sensor rides on the front for obstacle avoidance, with system control courtesy of an Arduino. For more hardware info check out his build log. Don’t miss the video after the break. You’ll see that the little bot can be manually controlled, or allowed to roam free. As we said before, the behavior is fantastic. Not only has [Jose] programmed interesting characteristics like the spider getting tired and sitting down for a while, but when it is awakened it leaps into the air. The movements are fun to watch for human and feline alike; if only your house cat could be so lucky. [Mark Gibson] sent us a load of details on his build, a WWVB atomic clock using a pinball machine marquee (PDF). This is the upright portion of an old machine that used electromechanical displays instead of digital electronics. It’s big, noisy, and seeing it running might make you a bit giddy. Luckily he included video that shows it working on both the outside and the inside. It took a bit of probing to discover the connections for relays that control the display. From there he used optoisolation to drive them with an Arduino. With this hurdle behind him, [Mark] set out to add atomic clock accuracy. He picked up a WWVB module and added it to the mix. Check out his build log in PDF form linked above. 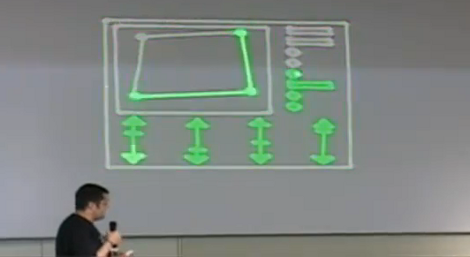 He went out of his way to explain how the original parts work, and the processes he used during prototyping. For more of those juicy details we’ve added a photo gallery and his video after the break. Didn’t get enough pinball goodness from this project? Check out the this digital gas plasma display pulled and reused from a much more modern pinball machine. Oh, and there’s always Bill Paxton Pinball. 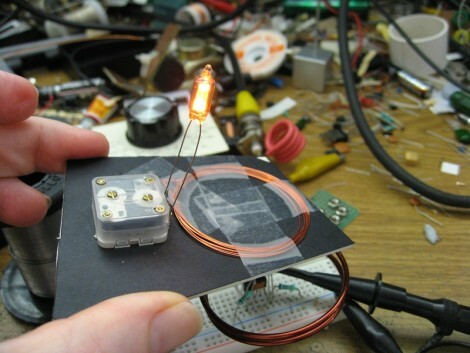 [Alan Yates] is building a persistence of vision display and needs a way to transfer power from the stationary base to the spinning circuitry. He’s decided to go with wireless energy transfer and he’s sharing all of his research and experiment data from the development process. It comes in two forms, the written version we just linked to, and a 37 minute video which is embedded after the break. If you liked some of the inductive energy transmission devices we’ve featured in the past, [Alan’s] video will fill you in on the why’s and how’s by using a combination of illustrative schematic examples and measurements on test coils that he built. 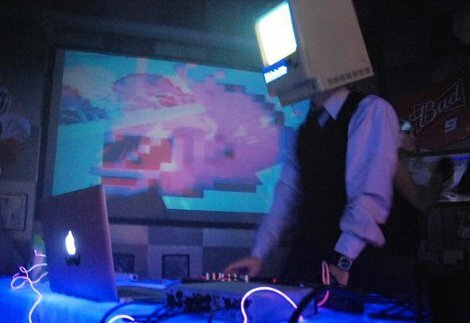 Elaborate helmets are not a new concept, with many famous artists such as Daft Punk and Deadmau5 using them for stage shows. For a sculpture class, [Terrence] fashioned his own out of the body of a Macintosh Plus and an iPad conveniently sourced from eBay. After gutting the insides, the Mac Plus was fitted with parts from a helmet both for comfort as well as for keeping the whole setup head mounted. For additional eye candy, an LED visualizer was affixed below the iPad display. The rig is remotely controlled by a bluetooth keyboard, just for good measure. We think this setup easily stands up to other Daft Punk-esque style head mounts. Be sure not to miss the video of the helmet featuring DJ Chameleon (a friend of [Terrence]) in action, as well as a number of other photos. Without a doubt, Laser Projectors are a great way to project large, bright images on any surface you can imagine. With a high enough quality projector and software package, excellent images and visualizations can be displayed in real time. [marcan], of the openkinect project, decided that there were not any open source laser projection packages out there that suited his wants or needs, so logically he decided to write his own. Because home-made laser projectors often use the audio out port of a PC, building the framework on top of the JACK unix sound software to control the hardware made perfect sense. OpenLase includes plugins for audio visualizations, 2D and 3D gaming, as well as converting video streams into laser format in real time. Be sure to check out the Chaos Communication Congress presentation [marcan] gave after the break, as well as all the extra demo videos on his website.